Customers who have reports created in Sage Financial Reporter (FR) can leverage existing financial statement in Sage Intelligence (SI). When using SI, you can start with an existing Sage Intelligence report, or a blank Excel spreadsheet. This process, will enable you to start from an existing financial statement created in FR. 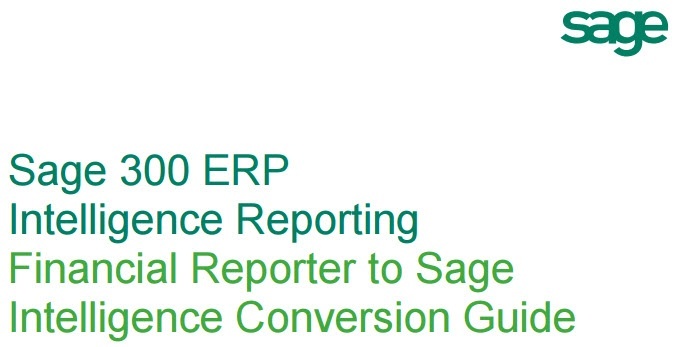 While Financial Reporter specifications (specs) are not natively compatible with Sage Intelligence, this document provides guidance on how design concepts of an FR report, can be converted into Sage Intelligence Financial Report Designer layouts. To download the conversion guide, click the below link.